Inspiration: As a retired veteran one of my biggest stresses leaving active duty was trying to find the resources I needed. this app is a way for me to insure my brothers and sisters in arms will never leave their service feeling lost. 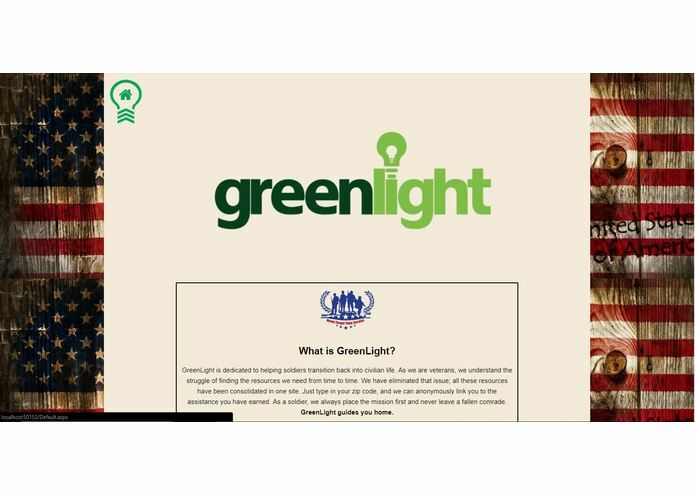 What it does: GreenLight will allow a veteran to anonymously enter their zipcode and find not only available resources but also give them a contact to reach out to in order to expedite the veteran getting the help they need. How I built it: We started by making a database of contact information and resources for veterans as well as a list of zipcodes and then put that database into a simple site for veterans to be able to access and use. Challenges I ran into: The first challenge we ran into was getting all the information for the resources, the next big issue was deciding to change from PHP to ASP. Accomplishments that I'm proud of: We are proud that we where able to pool our knowledge and write this site in a language we where not familiar with and on a personal note I like making something that can honestly improve the lives of men and women who to often fail to find help because they don't know where to look. What's next for GreenLight: Ultimately the plan would be to expand the database to add more contact information for more areas to assist a wider range of service members.